Standing desks are gaining popularity these days. Every firm and employees are preferring standing desks over chairs and couches. Since long hours on chair causes issues physically and mentally, standing desks are the perfect substitutes. Most of the organizations are choosing desks over chairs because of the improvement in efficiency and productivity. 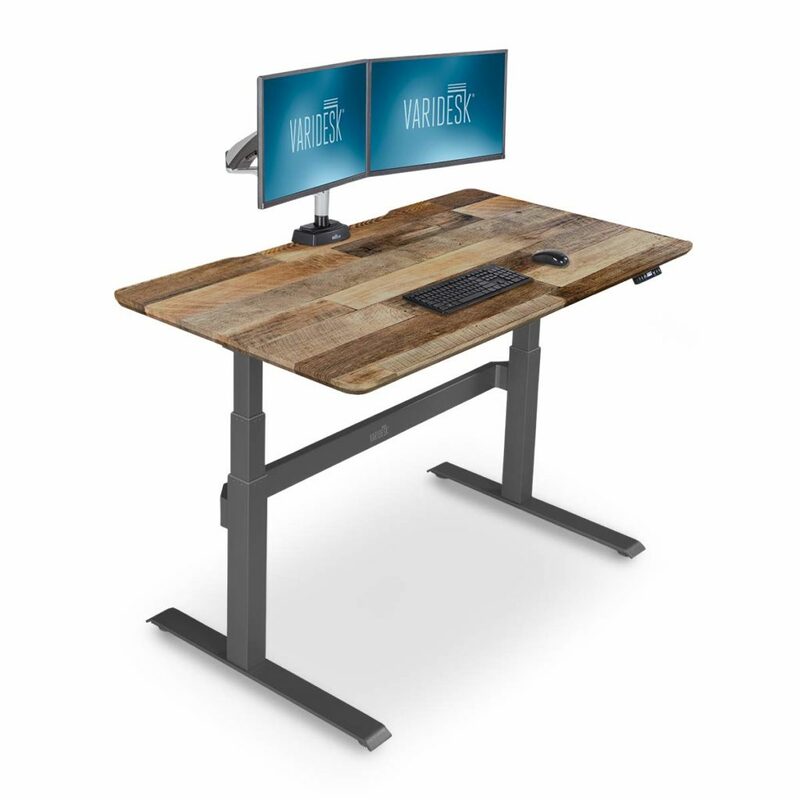 These desks come with the advantage of height adjustments while converters are more adjustable desks which help to customize according to the user’s need. Since these desks are new to the market, it is quite common to have more doubts about it. We are trying to answer all those questions through this blog. Standing desks come in a wide range of prices. As said before, you can also opt for the option of DIY customization to save money. In a world demanding restless hours in front of a computer screen, it’s not a surprise when people pick to stand rather than sitting. The way standing desk are appreciated shows the comfort factor is not a concern in this case. The health benefits of standing desks include weight loss, back pain relief, low risks of obesity and prevents cardiovascular diseases. Long hours on seats may lead to depression and stress. Stretching out on standing chair helps you relax and relief from fatigues. Since standing desks come in all varieties matching your requirements and comfort, why not change to standing desks. In the corporate world, the rate of health issue is increasing daily. The promotion of products like standing desks helps to phase out these risks. Below we are mentioning some essential features to keep in mind while purchasing a standing desk. Weight Capacity: The weight capacity of your desk is significant. Most of them have wooden manufacturing material, check for the durability of the wood. It is recommended to go for bamboo desks since it is known to be the most excellent quality. The desks should be firm enough to withstand the electronic devices, other necessary items and sometimes your weight too. 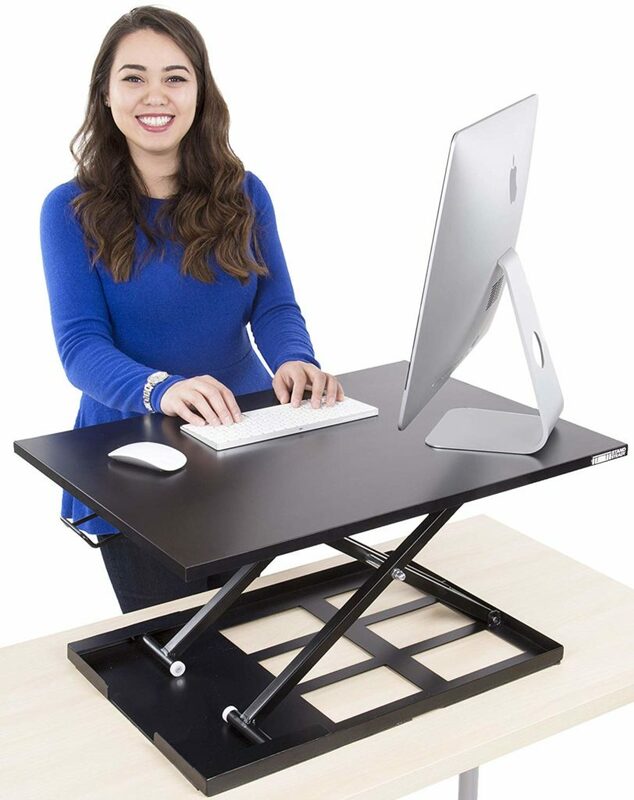 Appearance: Appearance does matter when it comes to a standing desk. An appealing desk motivates you to do your work with enthusiasm. The professional class your standing desk delivers makes you feel the positive vibe while working. A dull looking desk may affect your mood badly. Along with quality look for a classy finishing touch which makes you love your desk. A couple of dollars more may land you the perfect one. Remember, for you a desk is to work, why not go for a one that makes you work? Flexibility: Always go for the desk which is customizable according to your need. Whether it is a standing desk or converter, look whether it suits the environment where you are planning to install it. Be careful with the size and height. Look whether there is space for multi purposes. Check if it comes with a sitting chair or it is allowing to add a converter to it later. The desks with space for customization is always worth the price. Budget: This is where you need to plan things out. The desk offering advanced features will be higher than the one with decent features. Take all your requirements into account and then go for the one matching your needs. Investing in a standing desk need proper budgeting. Because a standing desk is a long time investment, crossing the budget is also worth a thought. Plan accordingly and choose wisely. Type: Standing desks are available as electric and manual desks. Switches/buttons manage electric desks. Everything from adjusting the height and level, all the features are accessed through your fingertip. While the manual desks need you to do all the work, this may sometimes cause difficulty since the handling and adjusting may cause a mess. Electric ones are costly and also practical. But again choose the one according to your need and budgeting. If your desk doesn’t need customizing all the time, then the manual desk will be a good choice, but when the customizing often, it is recommended to go with the electric ones. Size: Next important feature is to consider the size of the desk. The size of the desks starts from 24 inches in width. If the desk is for one user at a time, then choose the lower sized desk, but when multiple users or devices are expected to work at the same time, then there is a need for a bigger sized desk. The size of the desk matters when taking the purpose of the desk into account. The desk for your point of view. Assembling: Most of the brands offering electric desks come pre-assembled, while some need to get assembled. Follow the instructions carefully before assembling or else ask for expertise to do the task. The ones pre-assembled helps you with shifting later but still learning to assemble by yourself may come in use later. Warranty: Purchase the desk with more than 8-year warranty. Usually, it comes with at least a 10-year warranty. Consider the warranty period before purchasing and understand the terms and conditions as well. Remember to go with the reputed brands since they come with minor issues and excellent services. Customization: Before going for the desk, check whether it is suiting your environment or blending in with your other furniture. Also, look to what extent it is customizable. Check for the adjustments features, space for more devices, useful enough for your demands. 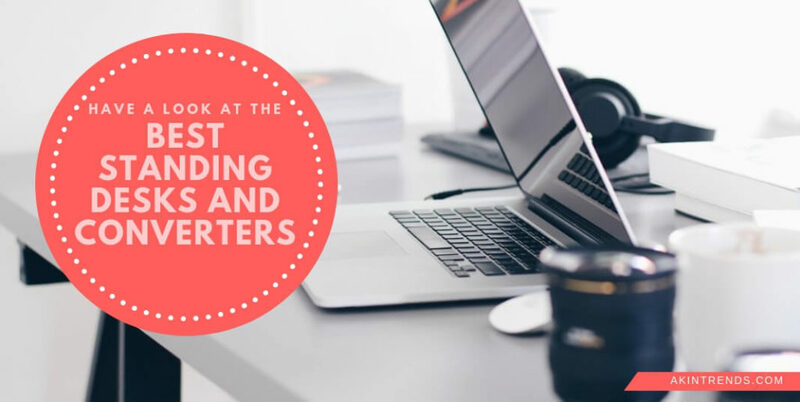 Titled ‘The best standing desk of the year’ for four consecutive years, Jarvis Bamboo tops this list. As the name says, it is made up of good quality bamboo which guarantees the sustainability of the desk. 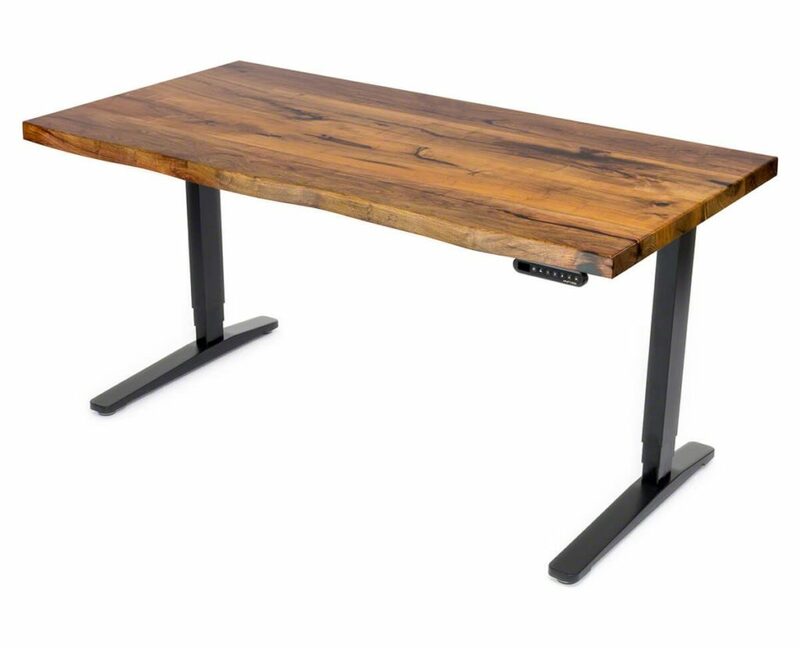 The dashing structure of the desk is impressive, and it will beautify your workplace. Unlike other desks available in the market, Jarvis Bamboo comes with the natural pigmentation that helps it shine brightly. Jarvis bamboo blends perfectly with the ambiance of the place where the desks come in use. It is sturdy enough to support all your devices and gadgets and has a weight capacity of 350lbs. The fine quality manufacturing gives it the cogency to meet our expectations. The programmable LED interface of the desk makes it comfortable and easy to use. Lander desk holds the second position on our list. One of the advanced standing desk with cool features. The desks come with a hand controller which operates the desk. The controller is to access all the characteristics of the desk; which may seem to be confusing at the beginning. It’s just a matter of time until you get familiar with the desk. The features and controls make the desk impressive. The desk comes preassembled and can be installed within minutes. The desk has a multicolor high-resolution display and is compatible with smart device connectivity. Uplift bamboo desks are one of the big desks in the market. The unique design of the desk is pretty impressive. The desks come in groove cut-out model as well as in the ordinary model. All the necessary accessories come along with the desk eliminating the chance of additional purchase. The desk may not be that appealing, but it is known for its durability. In spite of its mixed user experience, Lander Desk gets the admiration for what it can offer. 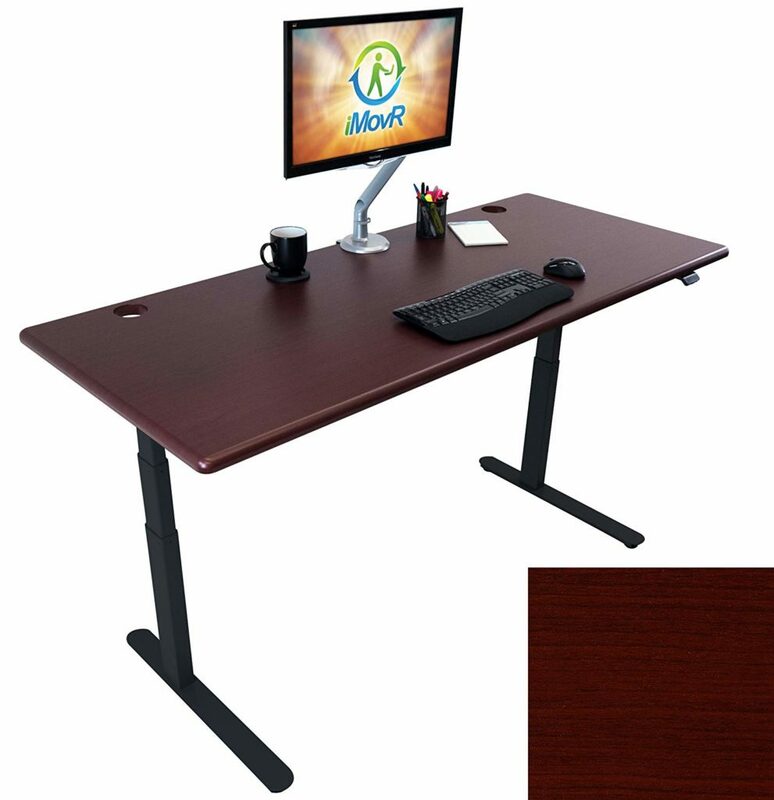 The desk comes with 6′ 6″ inches height which is adjustable from 24 to 51 inches. This converter is suitable for those who are not planning to spend for a standing desk. I can be attached to your table and customize according to your need. The advantage of converters is that they are portable and easy to use. Made of wood with 27 inches width and 6’5″ inches height the converter offers two different height adjustments. The converter also leaves space for additional accessories. 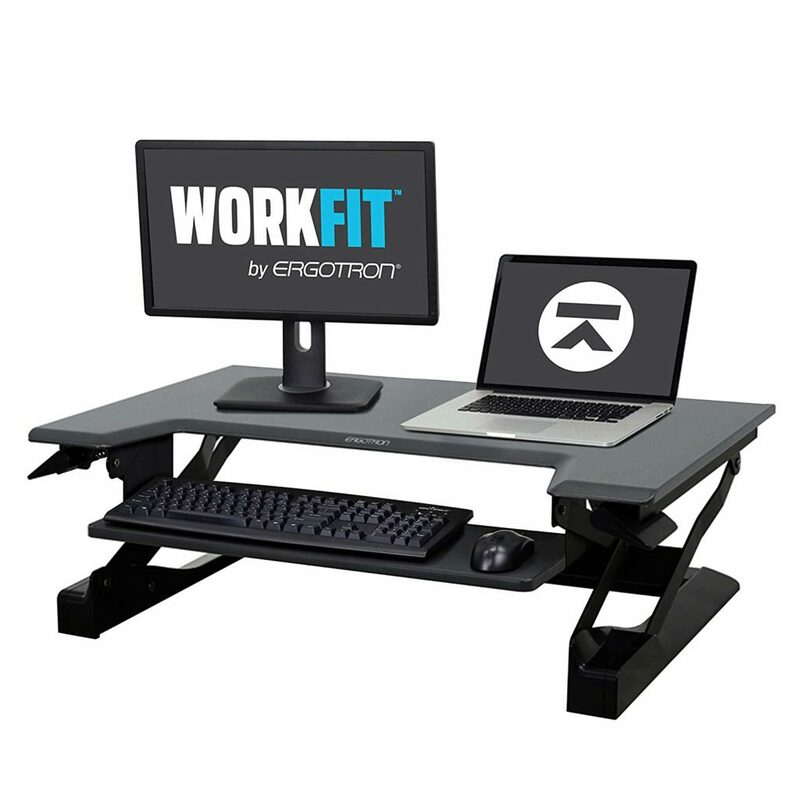 Ergotron Workfit is also a popular converter. This converter comes with decent quality and design. Its shifting adjustment is restricted to only vertical altering and has switches to access the feature. The advantage of this converter is that it is pre-assembled saving you all the time. Next good choice for the list will be Varidesk Electric. Stability is what makes Varidesk outstand its peers. It is Flexible for all types of adjustments. Even though its structure and design are satisfactory, the operating and handling of this desk it worth the try. This desk comes with a paddle, hex wrench and cable management loop. The quality of the desk is excellent and smooth. Varidesk is popular; it comes with mixed user reviews. Hard to assemble. It takes almost 30-35 minutes. Geekdesk Max is the cheapest and decent standing desk you can go for. 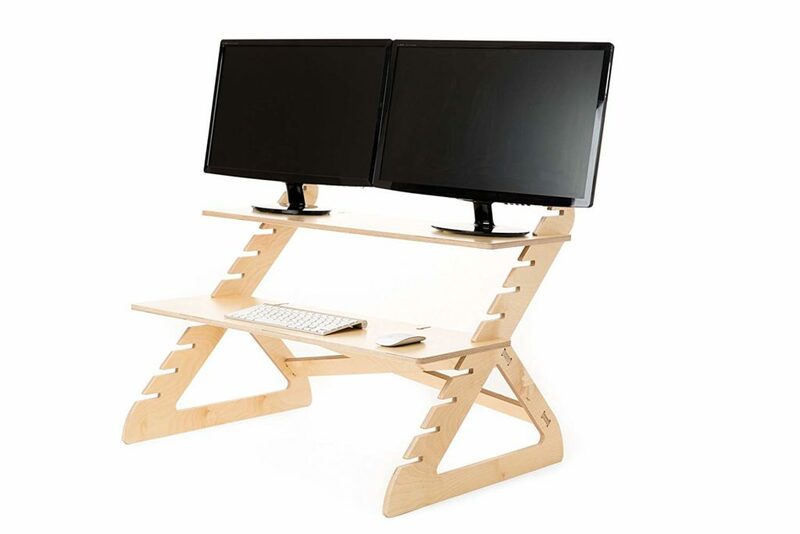 Geekdesk comes from a company known for manufacturing high-end quality products. The desk is not suitable for tall people since it comes with a crossbar. 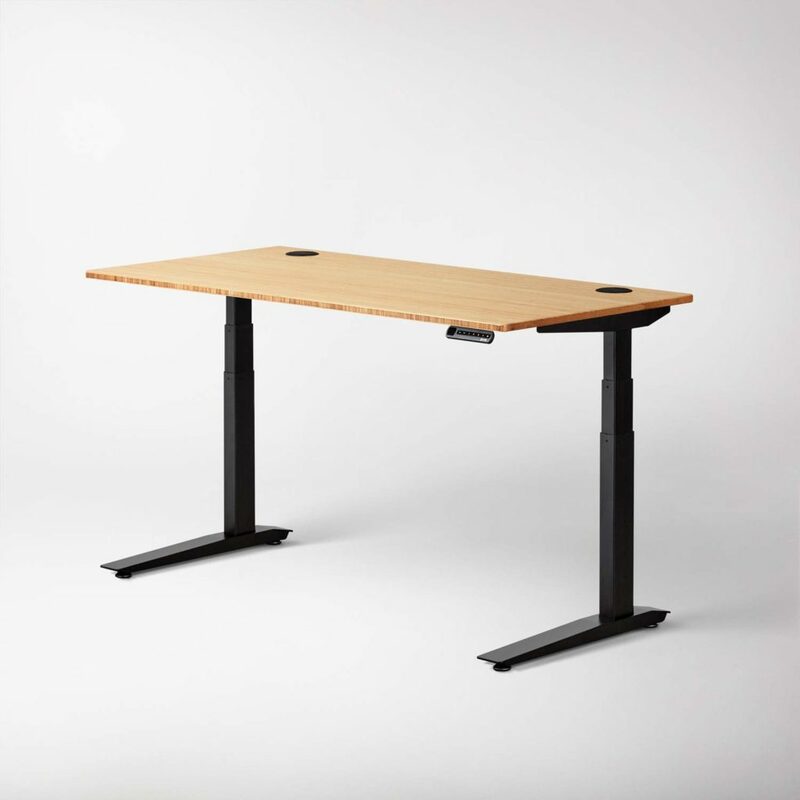 Geekdesk is perfect for a single user and comes in sound quality and a reasonable warranty period. Affordability is the significant advantage of this desk. Geekdesk is the right choice for basic and simple features despite its pros and cons. Assembling of the desk needs time. Follow the manual carefully. Standsteady is our next pick for converters. The desk comes with solid quality with quick altering techniques and comes with a premium pump assisted lift. The transformation from a sitting to a standing position takes only three seconds. It can be adjusted from 7 inches to 16 inches according to your comfort. It comes with a surface area of 28 inches × 20 inches. It weighs around 27lbs and can withstand a 20lbs weight. The desk doesn’t need assembling since it comes in pre-assembled mode. 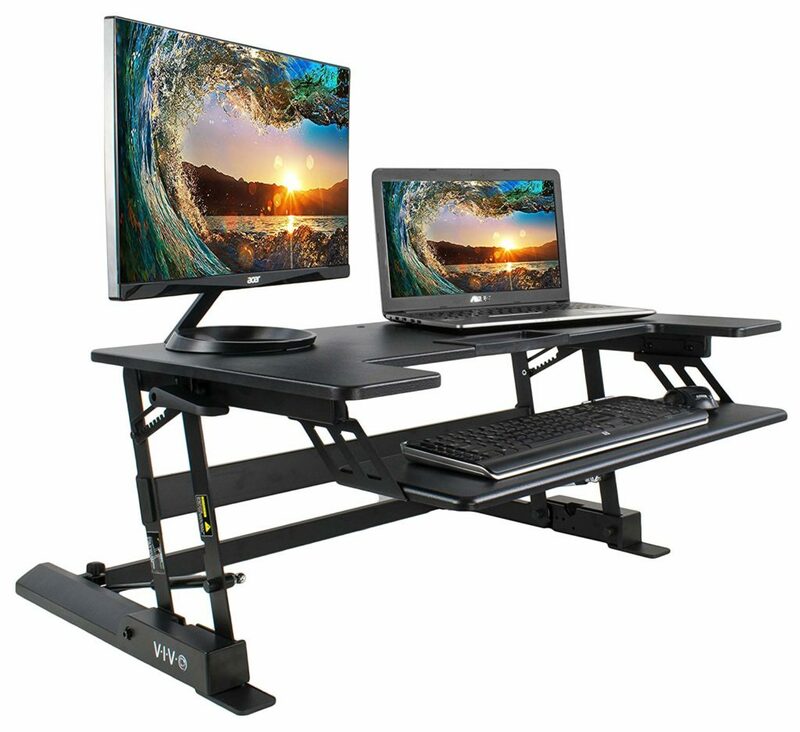 A standing desk converter from the reputed brand VIVO. Being the top-selling product from the brand, this converter is of high quality and affordable. The mechanism is so smooth that it alters from sitting to standing within seconds. The height adjustment can be made up to 19 inches. It is spacious enough for multiple devices or gadgets. It also comes with a deck for keyboard and mouse. The surface area is 35.25” × 23.25” which is spacious enough. The desks come with a three year warranty period. The desk comes pre-assembled leaving only the installing part to us. 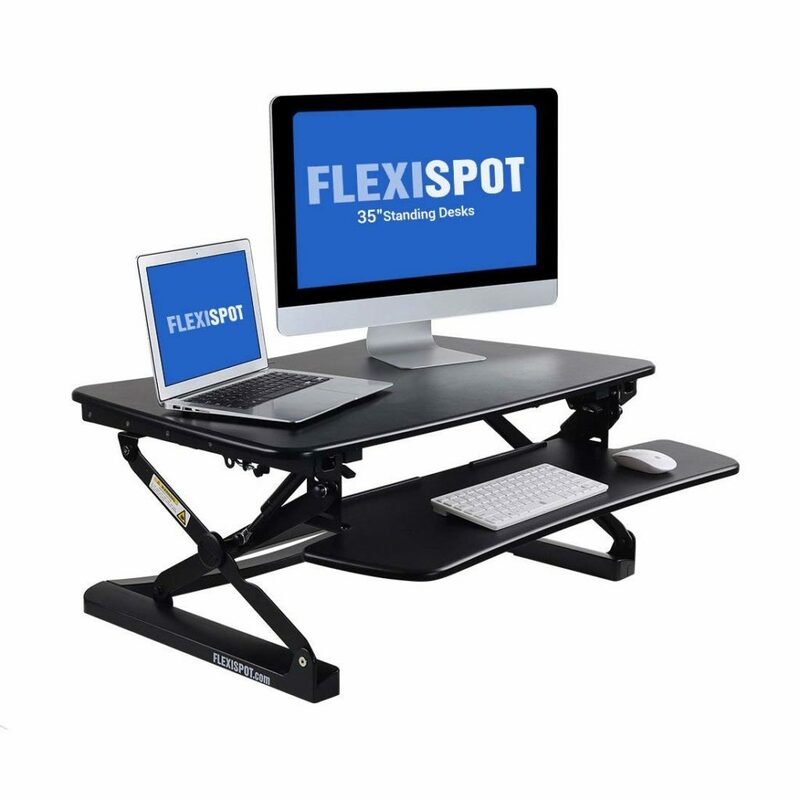 Flexi Spot is a standing desk converter with some quality features. With a weight capacity of 35lbs and weighing 50lbs, this converter comes with 31″ × 22.3″ surface area. This converter also comes with a unique deck for keyboard and mouse. The technique is smooth and quick done by gas driven spring motion. The converter open ups to twelve height adjustments. The converter comes in black and white color and is available in three different sizes. A popular misconception is that standing is more tiring than sitting, but that’s not the case. Standing impacts energy level. It enhances your mood and makes you feel relaxed and calm. 90% of the users agree with the fact that standing makes them feel energetic than spending a whole day sitting. When you feel energized, you work more efficiently. More efficiency leads to more productivity; this explains the acceptance of standing chairs in the business world. While standing, it eliminates the chance of distractions. The enhanced mood makes you focus more effectively on your work. Experienced users concur this fact and advise others to go with standing desks. A report from the American Cancer Society shows that sitting for 6 hours and more may lead to premature death. The health issues following the work culture lifestyle affect your mental health as well as your physical health. A weak body is more prone to health hazards. Also, studies show that the rate of shorter lifespan is higher in women than men. The telomeres in our DNA will stop multiplying when our body becomes weak and unhealthy. Standing desks helps you to prevent this from happening to you. One of the universal health issue due to body inactivity is obesity. The continuous blocks in the circulation of fat absorbing enzymes lead to obesity. Standing eradicates this and helps you from putting on unnecessary weight. An experiment by James Levine on a few workers showed that workers using standing desks showed less weight gain when compared to those who didn’t. Standing desks helps you to regulate your blood sugar level. Sitting for a more extended period leads to an increased level of insulin in your blood. When you stand, the processing of glucose is done effectively and results in a balanced sugar level. Standing desks also helps to maintain a healthy heart. While working for hours, we adopt an awkward sitting position for comfort. It results in an improper way of breathing. Since breathing is also one of the factors for good health, the flow of oxygen and blood determines the health of your heart. While standing, the posture allows your lungs to expand and have enough a proper breathing system. It helps your heart to remain healthy. People with occupation demanding for ‘standing position’ is said to have a 50% less risk for heart diseases than others who sit for hours to do work. Risk of cancer is higher when your body gets restricted to a sitting position. But standing makes you become mobile and it enhances the antioxidants which reduce the chance of cancer. Standing desks play a major part in improving your posture. A good posture not only enhances your appearance but also helps in your internal health. As mentioned above, breathing is as important as food and exercises for proper health. Standing position improves your breathing as well as posture. Bad posture may cause back and neck pain. Adjusting the standing desk according to your height and comfort prevents you from slouching or bending. It also reduces the fat from your abs and hips, since standing also burns calories. A fact about standing desks is that they give you the same effect from jogging. Endorphins are responsible for our mood enhancement. Your work in standing position this also releases endorphins which helps you feel pumped all long. Thence your mood and performance drastically improve.